Thanksgiving is over, and you know what that means. It’s time to start listening to Christmas music!!! 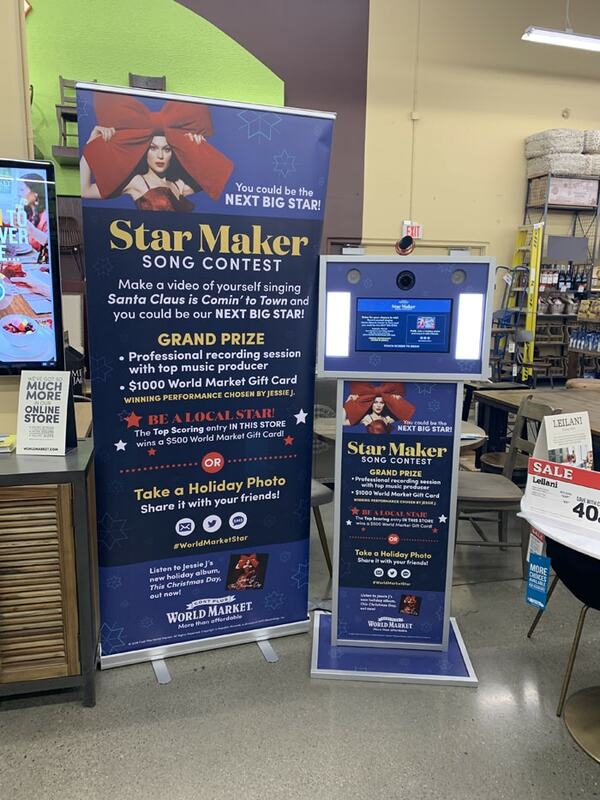 If you love Christmas music as much as I do, then you’ll be excited to hear that Cost Plus World Market has partnered with GRAMMY® Award-nominated, multi-platinum superstar Jessie J. to feature an original recording of Santa Claus is Comin’ To Town in their new Christmas video. Jessie J. will also be choosing the winning performance for Cost Plus World Market’s Star Maker Song Contest. 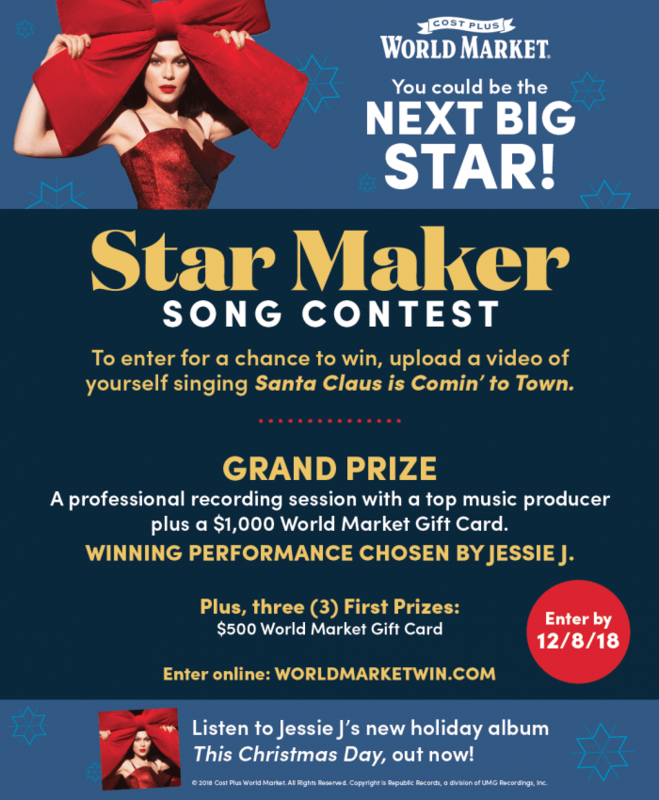 One lucky winner will have a chance to record their version of “Santa Claus is Comin to Town” in Hollywood with a top music producer and a $1,000 Cost Plus World Market gift card! 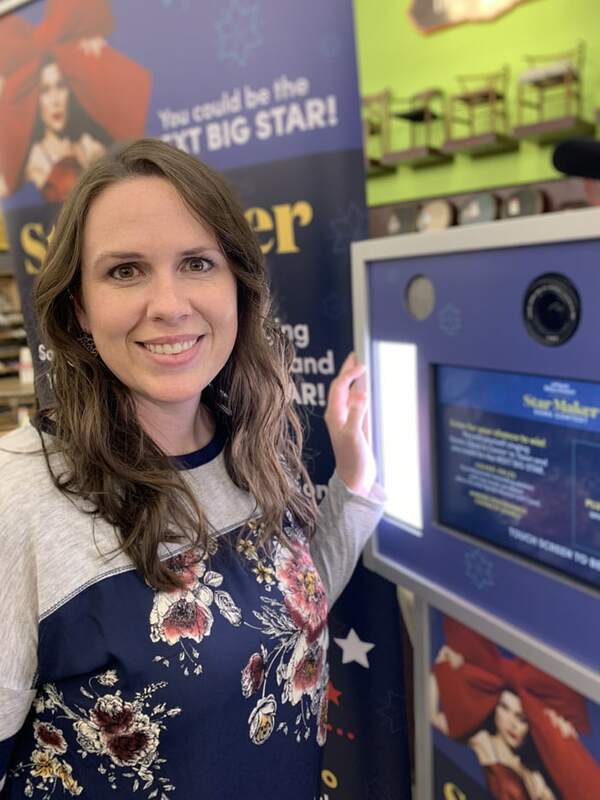 Play the video below or watch it on YouTube to see more information, and keep reading for a music lover’s gift basket idea. This is such a fun contest! For a chance to win, upload a video of yourself singing Santa Claus is Comin’ to Town! Grand Prize: A professional recording session with top music producer plus a $1,000 Cost Plus World Market Gift Card. Winning Performance Chosen by Jessie J.
It’s easy! Sing Your Heart Out! Create a video of yourself singing Santa Claus is Comin’ to Town. You can create your own musical accompaniment, sing a cappella, or use the instrumental version with lyrics here. Submissions using non-original music will be disqualified. Complete the registration form, upload your video and you’re on your way! Videos will be moderated for acceptability before they appear in the Contest Gallery. Cost Plus World Market will send you an email when your submission has been approved. Share your video on social media, show your friends how talented you are and ask them to vote for your video! rejected by website and you will be asked to re-submit. instrumental music, the instrumental version with lyrics here, or a cappella without instrumentals. 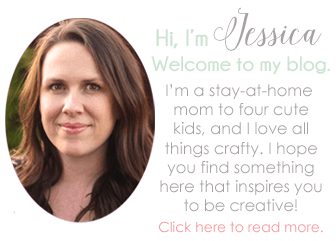 This is such a fun contest! 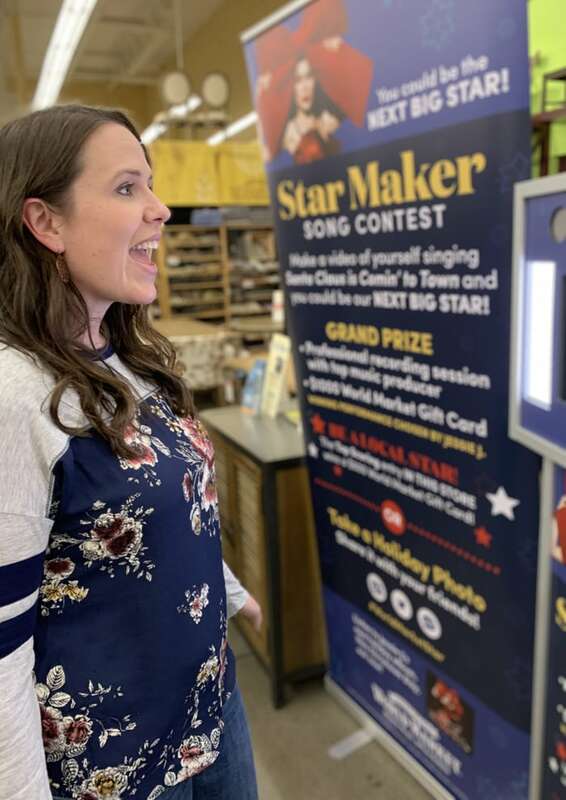 Have fun and share your talent with Cost Plus World Market. Hurry up and enter for your chance to be the NEXT BIG STAR! It’s very easy to enter in the store. Just find the kiosk with the touch screen and camera. There is a boom mic on top, so take a step back, it will pick up your voice. Follow the prompts on your screen, and enter in all of your information. When you’re ready, face the camera and press the screen. And sing your heart out! 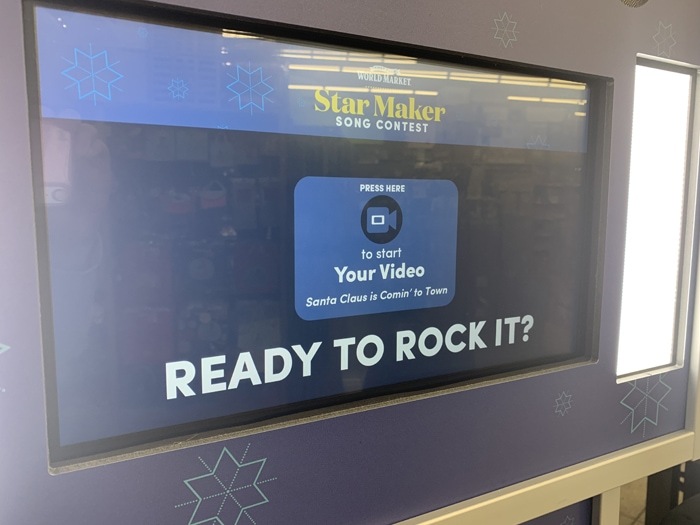 The camera will record you, so you can enter right in the store. So cool! Get some new Christmas music! I love Jessie J’s new holiday album! Listen to This Christmas Day, out now, or purchase your CD here. I’ve got a great gift idea for the music lover in your life. 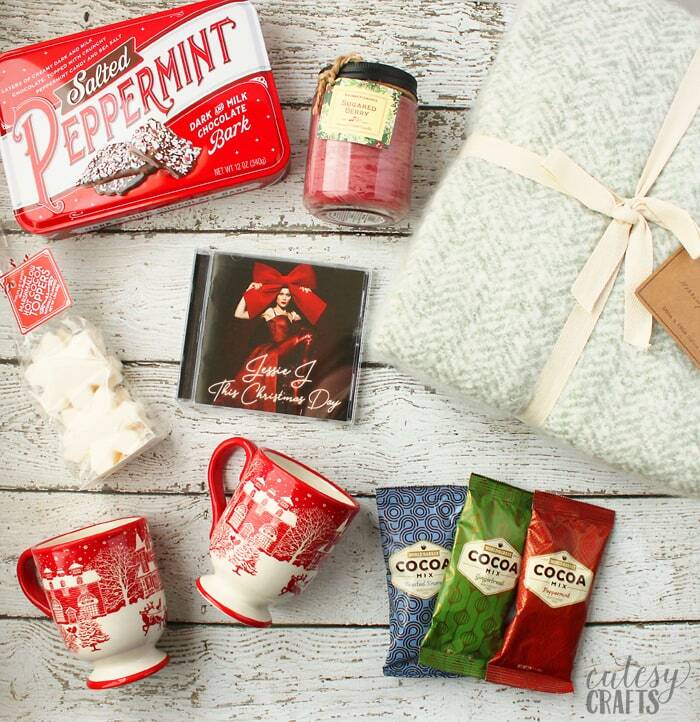 It’s a music lover’s gift basket. My son has a guitar teacher that has been teaching him to play for the past couple years. He’s pretty shy, but she has always taken the time to make sure he’s comfortable and has a good time. He loves his lessons with her now! To show our appreciation, I put together this gift basket for her. It’s full of some wonderful gifts for her. She can snuggle up by the fire with some hot cocoa and a warm blanket and listen to Jessie J’s new holiday album This Christmas Day. 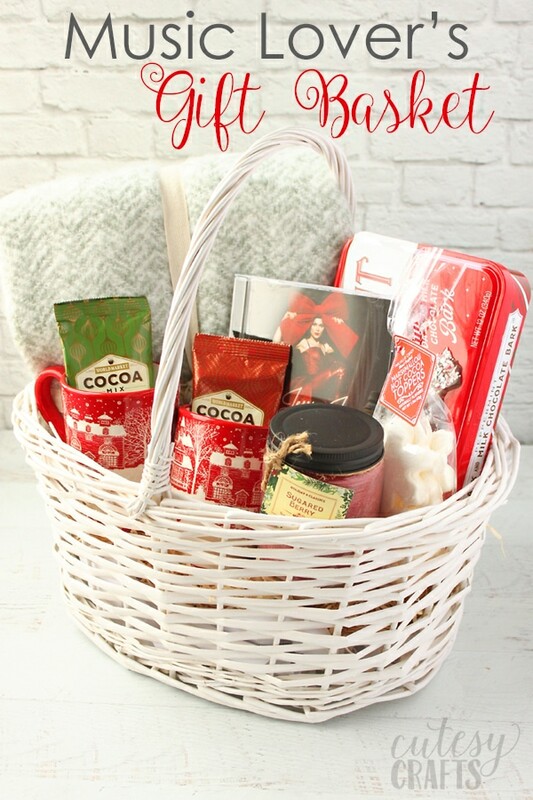 Included in the basket are some fun cot cocoa supplies. 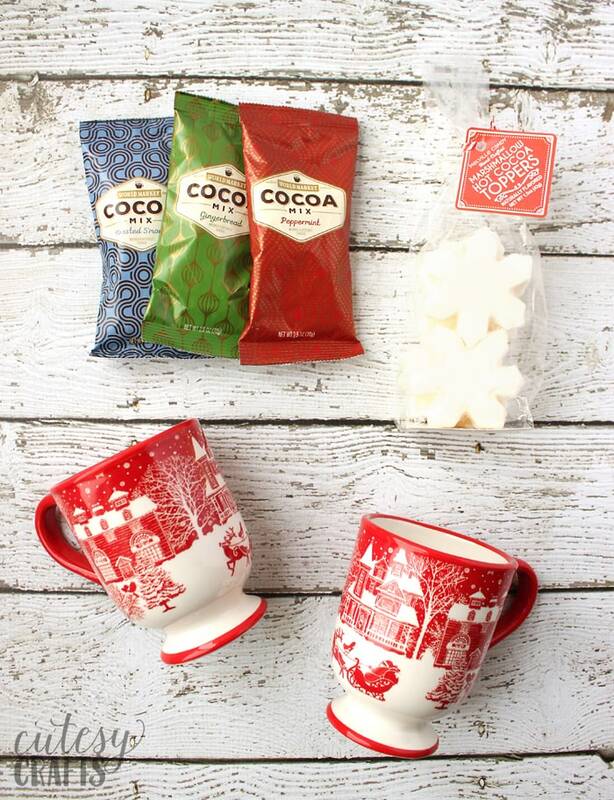 They have they cutest marshmallow hot cocoa toppers. I got these snowflake ones, but they also have some adorable snowmen. 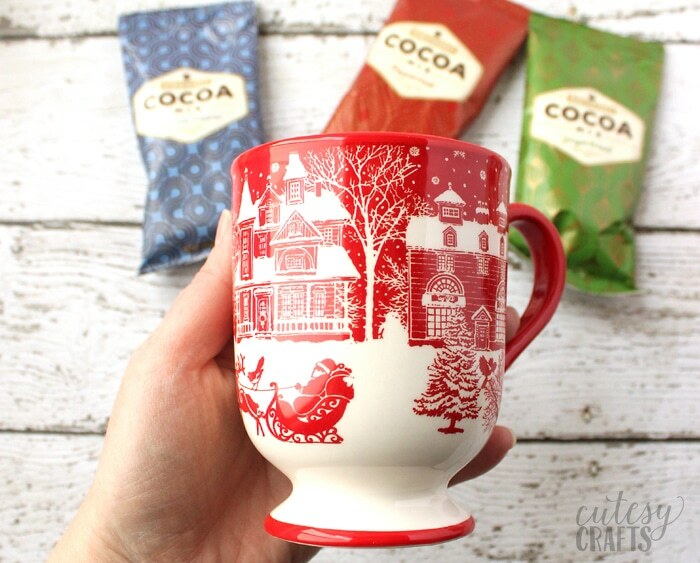 These Santa mugs are so pretty! I love the red and white Christmas motif. They remind me of redwork embroidery. 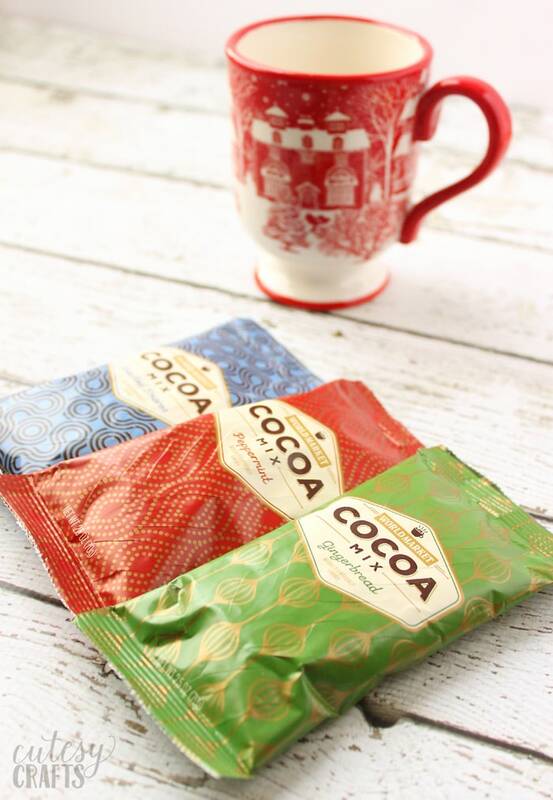 Cost Plus World Market has the best hot cocoa flavors. My family goes there every year to pick up their tasty mixes. I really want to try the S’mores one. I got these small packets for the gift basket, but you can also get them in larger canisters. This chenille throw is SO soft and luxurious! I almost want to keep it for myself! 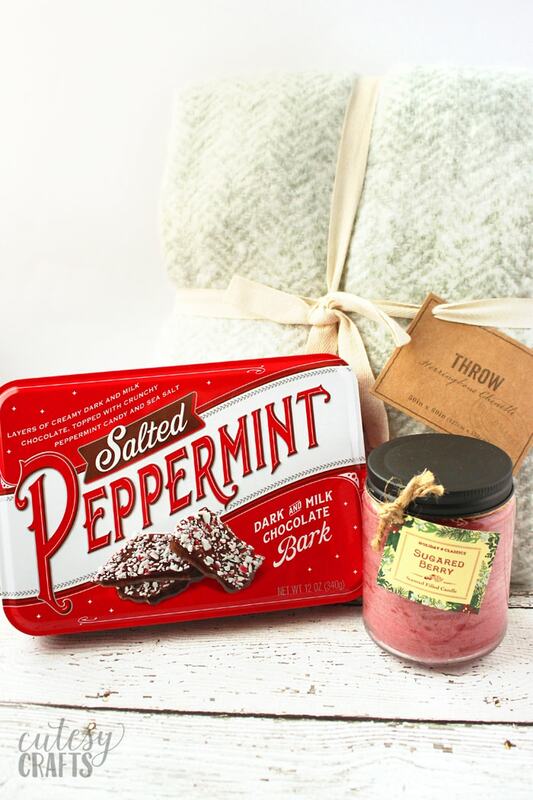 And isn’t this salted chocolate peppermint bark tin cute?! These are great for gift giving to your coworkers or neighbors. I also found this pretty holiday candle that she can light while she’s relaxing with her new Jessie J. CD. 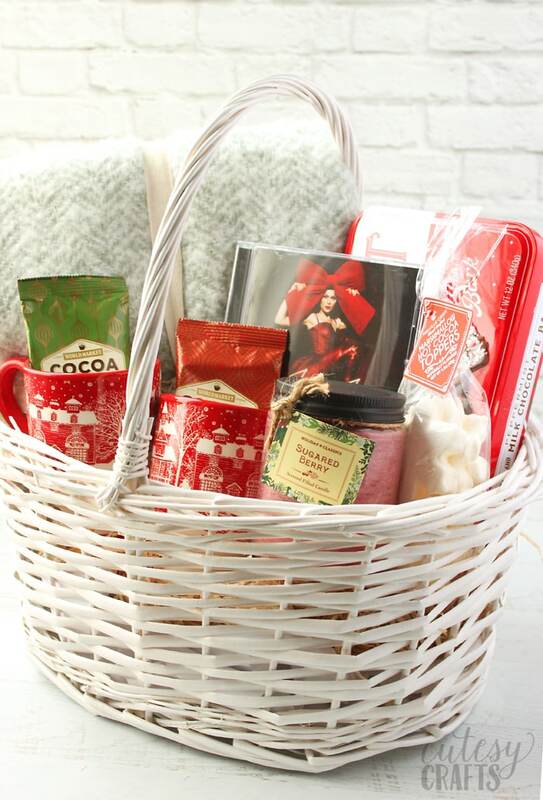 Cost Plus World Market has a great selection of gift baskets to choose from. 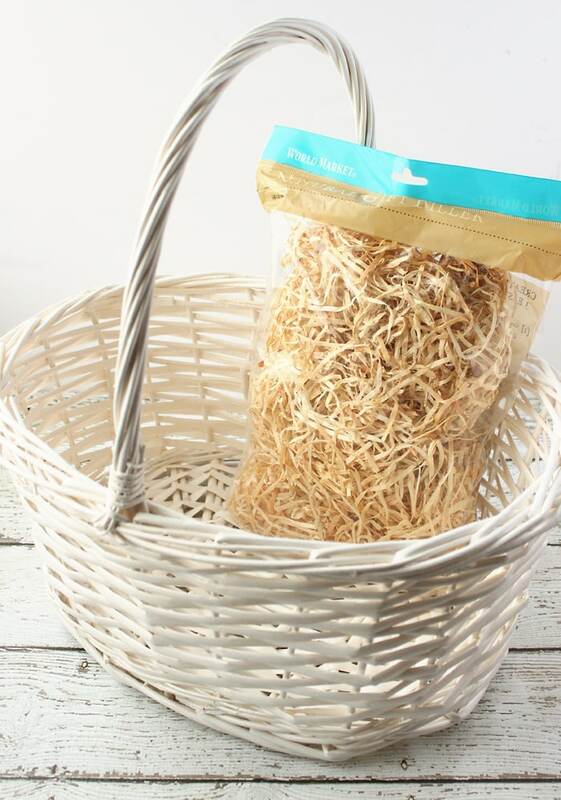 I chose this white oval basket and got some filler to put inside. 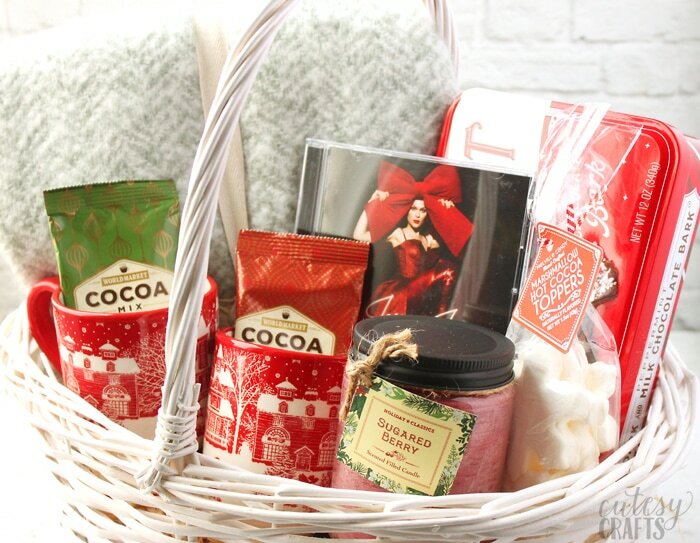 A beautiful and relaxing gift basket for the music lover on your list! I hope Evan’s teacher loves it! The cashier at the checkout said she was jealous of the person who would be receiving the basket. I’m a little jealous myself!